An ellipsometer is designed for determining the Polarization State of a monochromatic optical light pulse produced by a light emitting diode (LED). 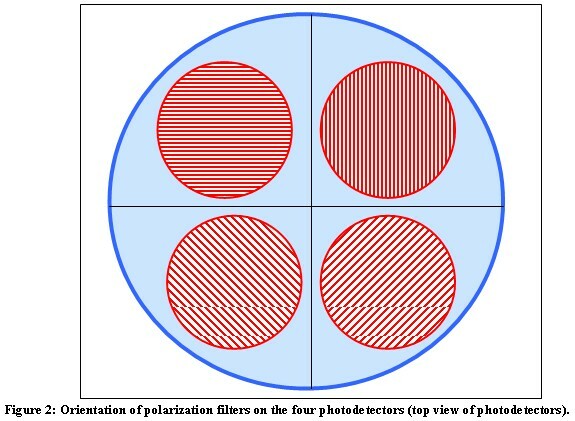 Using a polarization filter, each polarized beam is fed to four photodetectors that measure intensity. The advantage of such a device is to enable optical polarization analysis without the use of mechanical moving parts. Stokes parameters are obtained from the intensities measured from the four photodetectors and polarized intensity is calculated. The present invention relates to an ellipsometer, a device that senses the Polarization State of monochromatic light. The device measures all the parameters of the polarization state of light: the degree-of-polarization, azimuth angle, elliptisity and the polarized intensity through Stokes parameters calculations. Since there are no moving parts, the Hohner research team developed this device to require only 10msec for data acquisition while maintaining high precision and accuracy, solving previous problems encountered by ellipsometers, hence enabling a wider range of applications and lower costs. The Polarization State of an optical beam can be determined by traditional ellipsometry techniques. To obtain parameters describing the Polarization State of the monochromatic light, a set of measurements has to be taken from different positions of the polarizers, waveplates and photodetectors. Therefore, data acquisition time depends on how fast the polarizers; waveplates and photodetectors are moved to their various measurement positions. In addition, the precision of positioning the polarizers, waveplates and photodetectors influences the results of measurements. This method of obtaining the Polarization State of monochromatic light limits the use to nonpopular applications and needs skilled personnel to handle it. Previous methods for determining the polarization states of optical beams involved rotating parts, continuous operation, and laser beams. The inventor is aware of these publications describing such techniques. The first is US4158506 and the second is DE3931540. The techniques disclosed in the prior art evolved for laser sources. Similarly, the extensive use of waveplates as well as optical detectors which are not of significant importance for discriminating purposes. Furthermore, the Stokes parameters acquired form these elements are not sufficient to clearly distinguish the Polarization State of the optical beam for sensitive circumstances. Briefly, the subject invention is directed to an effective, inexpensive and precise way to define the effect of a clean, well-conductive smooth surface on the polarization of monochromatic light using ellipsometry techniques. Primarily, the source of light used in this device is an LED designed to give a pulse of light when required. Previous work, assume continuous light sources or laser beams. The first is a slow technique and unnecessary, while the latter is of very short pulse width that accuracy and information are compromised. Therefore, a pulsating LED with a controlled pulse width is the optimum solution with high accuracy. Determining the parameters of an optical pulse involves an array of four photodetectors. A polarizer, each with a different orientation, covers each photodetector. This configuration is ideal for obtaining the Polarization State of monochromatic light. Previously, we discussed prior arts using waveplates and a higher number of photodetectors to obtain parameters. We have found that with only four photodetectors, their polarizers and no waveplates you can obtain the same parameters, hence, saving time, cost and space while maintaining accuracy. The electric signals acquired from the photodetectors are used in conjunction with a microprocessor to produce information about the state of polarization. These calculations involve Stokes parameters, however, further calculations and derivations (e.g. Linear polarization) were required to obtain a clear and significant discriminator on the effect/change materials inflict on the polarization state of light, particularly, the effect of subclasses of certain materials on the orientation/state of polarized light. 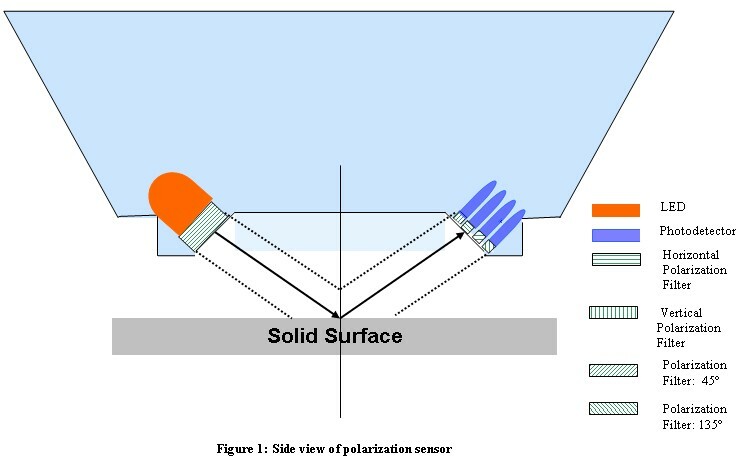 Figure 2: Orientation of polarization filters on the four photodetectors (top view of photodetectors). The operational principle of the device representing the invention is described with reference to figure 1. Each element of the four-element photodetector array is connected to a microprocessor, where a program is designed to acquire the values from the four elements simultaneously. These values then undergo signal conditioning and calculation to obtain all the parameters of the Polarization State of monochromatic light. This section gives a mathematical description of the calculation of the degree and orientation of the polarization of a beam, based on the observed intensities. Each target exposure measures the component of the incoming light polarized in two different orthogonal directions. The symbol Iα is used to represent the intensity of the component polarized at an angle α to the reference direction, then in each exposure the O ray image records Iα and the E ray image records Iα+90. Here, Ip and Iu are the polarized and unpolarized intensities of the incoming light, and θ is the angle between the plane of polarization and the reference direction. Where, Ip is the polarized intensity and θ is the orientation of the plane of polarization. We find clearly that the effect of the material is on the orientation of the elliptically polarized beam, as linear polarization increases, circular polarization decreases, and vise versa for an elliptically polarized beam. 1. 1. Optical constants depend on chemical composition and therefore are unique to every type of material. For industrial applications, Hohner research team developed a sensor using the polarization of light to distinguish between materials and their sub-categories. 2. 2. The system as defined by claim 1 herein comprises of an ellipsometer with no moving parts, consisting of an LED light source and four photodetectors, each covered by an independently oriented fixed polarizers. 3. 3. The system as defined by claim 2 herein comprises of four fixed photodetectors and polarizers placed in a way that the Polarization State of monochromatic light can be measured — refer to figure 1. 4. 4. The system as defined by claim 3 herein comprises of four polarizer elements having mutually orthogonal angles of transmission in one orientation Þ 0° and 90°, while the second orientation for the other two polarizer elements having mutually orthogonal angles of transmission at Þ 45° and -45° — refer to figure 2. 5. 5. The system as defined by claim 4 herein does not require waveplates for calculating parameters of polarization, on the contrary, software application is to compensate and mathematical computations are the substitute. 6. 6. The system as defined by claim 5 herein comprises signal conditioning and amplifiers to obtain higher accuracy. 7. 7. The system as defined by claim 1 herein comprises a microprocessor to simultaneously capture the various intensity values from the photodetectors and compute/calculate all required parameters giving results in msec. 8. 8. The system as defined by claim 7 herein comprises computation based on Malus’ law and Stokes parameters from the intensities acquired from the photodetectors. Where I0, I90, I45, and I135 are obtained: the first Stokes parameter (I) is computed as I = I0 + I90, the second Stokes parameter (Q) is computed as Q = I0 - I90, the third Stokes parameter (U) is computed as U = I45 – I135, and the last Stokes parameter (V) is computed through substitution in the above equations to obtain e and then compute V as V = sin2e. 10. The system as defined by claim 1, 7, 8 and 9 herein will output a single value from claim 9 to distinguish and discriminate clearly and accurately between materials and their sub-categories.